Enchanted, lifelike photographic art images of butterflies created to being inspiration and hope as well as bring about transformation.The Butterfly as Spirit guardian is linked to various traditions around the world, ancient Greek Mythology, where it was believed butterflies symbolized the human soul. In Ireland, butterflies are know for their ability to shift between worlds. Native American tribes believed butterflies carried wishes and prayers to the Great Spirit. Caterpillars greatest power is to transform themselves into butterflies. Butterflies represent positive times of transition and hopeful transformation. 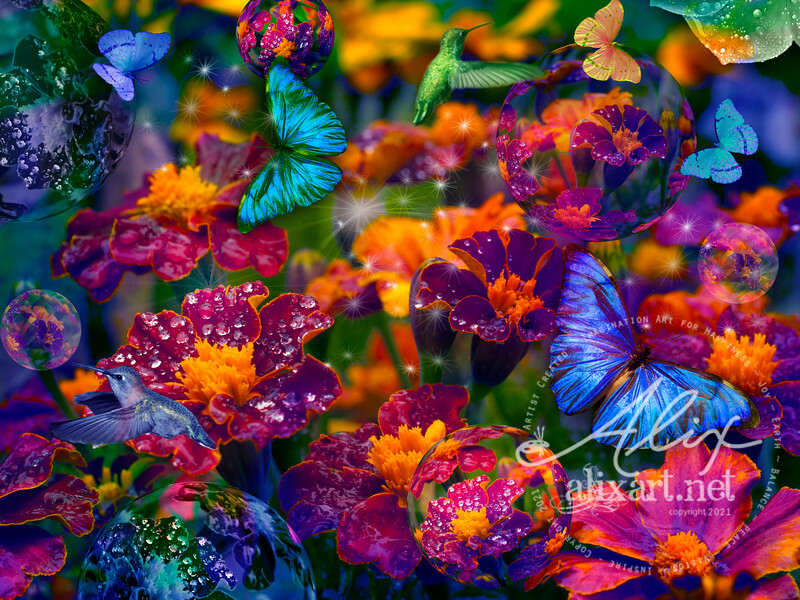 Bring Butterfly Magic into your life today by decorating your space with Alix's Butterfly Artwork. Purchase a special butterfly print today. tHE MICROSCOPIC WORLD OF THE SECRET, MAGIC GARDEN AFTER THE RAIN WHEN THE ENCHANTED ENERGY OF LIFE PERMEATES THE SENSES AND THE MIST ENVELOPES OUR WORLD AS THE MOON RISES. Please consider purchasing a print in support of the artist.